Here’s one of these points where all comparisons with Batman really fall apart. Bruce Wayne has a cool hi-tech car – the Batmobile. Matt Murdock… Well, let’s just call him “vehicularly challenged.” Luckily for him, he lives in New York where there are cabs everywhere (if his battle with Bullseye in issue #169 is any indication, he’d probably prefer to stay out of the subway). He’s also been known to travel billy-club style across Manhattan and I think he currently lives within walking distance of the office. Being blind, Matt obviously doesn’t have a driver’s license, and the fact that he lost his sight before the age of sixteen pretty much guarantees that he never had any driver’s ed either. That hasn’t prevented him from driving on numerous occasions in the Daredevil comic. Heck, in issue #100 (Vol 1) he was even seen piloting the Avengers’ jet, though I suspect that was before it was widely known in the superhero community that the guy probably shouldn’t be operating aircraft (though it might be argued that he can do so more safely than drive a car). When it comes to driving, Matt has met with mixed success. He’s never hurt either himself or anyone else that I can recall, but he’s had a couple of close calls when an emergency situation has forced him to get behind the wheel. I actually sort of buy the idea that he would do okay on a highway in the middle of nowhere, but inner-city traffic is certainly a little more challenging. After all, most road signs and traffic lights are not just for decorative purposes. Although considering Dakota North’s sweet ride in #107, he probably doesn’t mind hitching a ride with her. Anyway, let’s take a look at Daredevil driving, starting with Daredevil #8. Since this was back in Stan Lee’s day, Daredevil comes across as an expert driver. 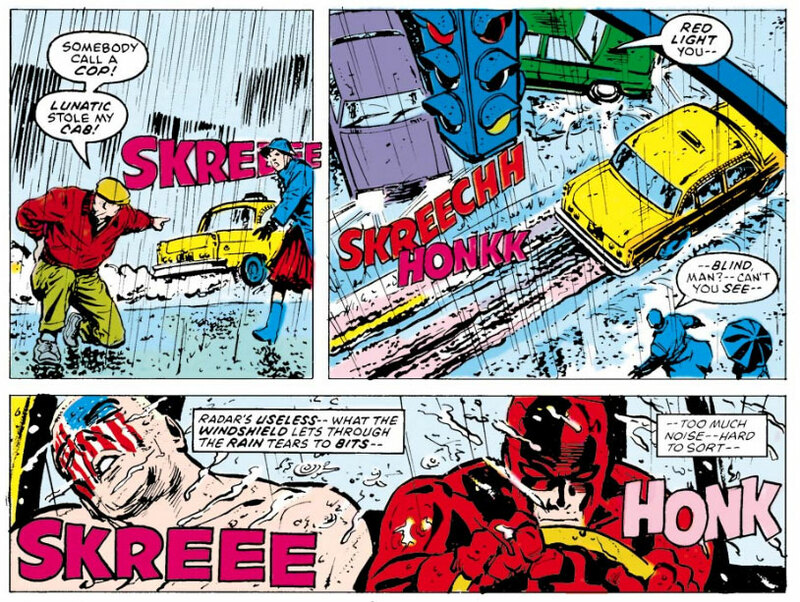 While Stan doesn’t actually say that Daredevil can “drive more safely than a sighted man,” we sort of get that feeling as he stops a runaway car, complete with a car bomb. If you recognize this first panel, it also appeared in a previous post on the radar sense, since it features the first depiction of the iconic radar rings emanating from Daredevil’s head. This next panel (these are all in sequence, by the way) strikes me as hilarious. I love the whole “No brakes! No brakes!” I’d love to see him yell “Look, no hands!” while taking both hands off the wheel. “I’ve got to keep guiding it… till the end!” Oh Matt, you’re such a drama queen (below). This panel below is actually pretty funny. First of all, I’d like for someone to explain to me the difference between images and sights (seriously). Secondly, the “master driver” bit? Gotta love it. In the last panel of DD driving in this issue, we seem him drive the car into the sea. His head looks dangerously close to colliding with that sign overhead. The next time we see Daredevil drive a car is in issue #54, written by Roy Thomas. As I mentioned in another post, it seemed that the book got significantly goofier for a while after Thomas took over and this page is certainly full of all kinds of goofiness. First of all we have another instance of Matt apparently wearing his shades under his mask. The rest of the page is of him remembering some of the details of faking his own death, which he did quite callously. Here he drives to an air field, and rents a plane with a fake license, disguised with a hideous black wig and – oddly enough – not wearing any shades. In case you’re wondering, the “passenger” in the car is a dummy that’s supposed to look like Matt Murdock. What I never got about this was why the dummy was necessary. It’s not like the people who find it at the crash site are going to confuse it with an actual corpse, right? There are many more instances of Daredevil driving, but the rest will be revisited in a second post. Before rounding this off, however, we’re going to look at two Frank Miller classics that both feature Matt behind the wheel of a car. The first group of panels below is from the last issue of Born Again. And the second from the last issue of Man Without Fear. Neither one of these occasions bore the marks of a “master driver,” but at least no one got hurt. And, in an emergency, you’ve gotta do what you’ve gotta do, right? For a more recent example of Daredevil driving a taxi, take a look at the panel from Vol 2 #103 posted by Francesco, which was the lead-in for this post, incidentally. More driving in a few weeks when I round up more panels of DD goodness. Every time I see a back issue where Matt is behind the wheel, I am WAITING for someone to make some comment about how Matt’s performance is in no way distinguishable from that of New York drivers in general. Maybe it’ll come up in Vol 4.